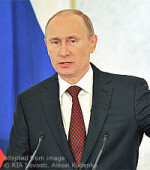 Vladimir Putin wished Orthodox Christians and all Russian citizens a Merry Christmas. “Over the centuries this holiday has brought us the light of faith, hope and love. It unites us around traditional moral values that play a special role in Russian history and are the backbone of our society. Christmas is the time of charity and mercy, sincere attention to those who need our help and care. On Christmas night, Vladimir Putin attended a Christmas service held in the three-altar church of the icons of Theotokos of Peschansk and Theotokos of Vladimir at the Holy Trinity and St. George Convent in Sochi.